On July 13, my westbound train on the Central Line of the London Underground subway system was pulling into Queensway station when it abruptly stopped. The driver's voice came over the intercom. The message was meant for the control room, but we passengers heard it too. "We have got one under," the driver squawked. "Send emergency crews immediately. He jumped. We have one under." My memories of what followed unfold in a series of images. I remember filing to the front of the train and thinking how it felt like leaving the bus on a school trip. I remember putting my hand on the shoulder of the driver and saying "I'm sorry" as he gesticulated frantically at two platform colleagues. I remember glancing down under the driver's carriage and telling my girlfriend not to look, and noticing how reassuring the warm bodies of the passengers felt as we crowded into a packed elevator to leave the station. I remember a blur of fire trucks and ambulances (how did they get there so fast? ), the screaming sirens and, later, a woman I recognized from my carriage pretending to browse a window of real estate ads as she wept. There are plenty of ways to commit suicide, but few more public than turning a multiton moving train full of passengers into a bullet. Last year in the U.K., 194 people killed themselves on the tracks of mass-transit systems, with some 50 of those choosing the sooty tunnels of the Tube. New York City's subway averages 26 suicides a year. In Paris, 24 died on the tracks of the Métro last year. While it is a fallacy to imagine any suicide as a solitary act  even the tidiest affair leaves survivors stricken  death by train is a particularly declaratory form of killing oneself. It makes the act a form of theater  for the driver, watching it all from behind his windshield, and for the rest of us. 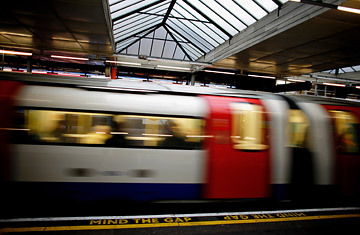 In the past months in Britain, there has been a sort of low-humming cultural unease about suicides on the Tube, which are readily announced over station intercoms as the reason for delays, presumably to allay fears of terrorism. A movie in general release, Three and Out, attempted to turn this unease into dark comedy by portraying a hapless Tube driver who tries to exploit a (fictional) loophole in his contract that grants him early retirement if he witnesses three suicides from his train. The film misjudged the nation's mood and was savaged by film critics, mental-health workers and the train drivers' union, whose members picketed outside the premiere of the movie. Their placards declared that suicides on the Tube were no laughing matter. Somewhere in the back of my mind, I must have remembered those picketers, because even in the daze of the moment my thoughts turned immediately to our driver. At the station before Queensway, Lancaster Gate, he had broken from protocol to announce to the pranksters holding up the doors not the scripted "Mind the closing doors" but the more personal "Please stop doing that or you will injure yourselves and end up in hospital." The statement had a slight "I-know-better" air, but it was also improvised, and showed concern for the passengers' well-being. I remembered this minor act of kindness as our driver addressed us on the intercom to announce the evacuation. He kept repeating, "This train is not going anywhere for some time. We have a man under the train, so the train is not going anywhere for some time." It became a sort of mantra: "I repeat: this train is not going anywhere for some time." It seemed an odd thing to say, and at the time I didn't pay it much heed. But I keep thinking about it, how the driver's life at that moment became connected with the man under his wheels, how their roles even merged (it was the jumper, after all, who had stopped the train, not the driver) and how he might feel at that moment about this particular journey. This train is not going anywhere for some time; the psychological damage will linger. I remain ambivalent about how to feel about the suicidal man himself  the only one, after all, to be physically harmed in the affair. It's surprising how many people have counseled me to reserve sympathy. He may have been a criminal or murderer, they say, a Crime and Punishment type, driven by shame or distraction to impose self-justice and end his guilt. In the ongoing discussion in my head, however, I counter with an equally plausible circumstance: a young poet, troubled by the world, driven by shame or distraction to oblivion on the tracks. To this my friends respond that people die from violent acts every day by no choice of their own; three years earlier, almost to the day, 39 commuters died in a terror strike in these very tunnels. Why suffer pain for one who wished such an end? I suppose the answer is that I have no choice. Human beings aren't wired to respond to distant suffering, but suffering this close was real and inescapable.